Fall being in the Camper is not as easy to decorate for. There’s a lot less places to add decor too and I guess with the pink it feels like a Summer hang out. 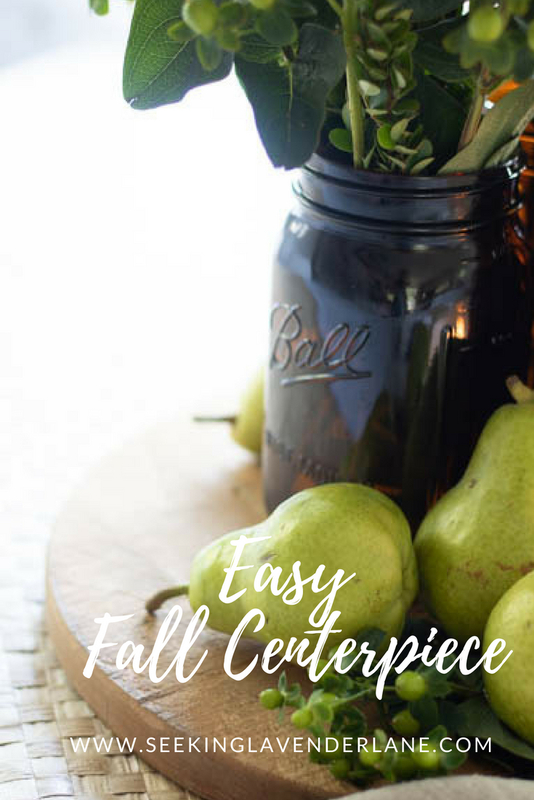 That’s until I lit my candles and created this easy Fall Centerpiece. 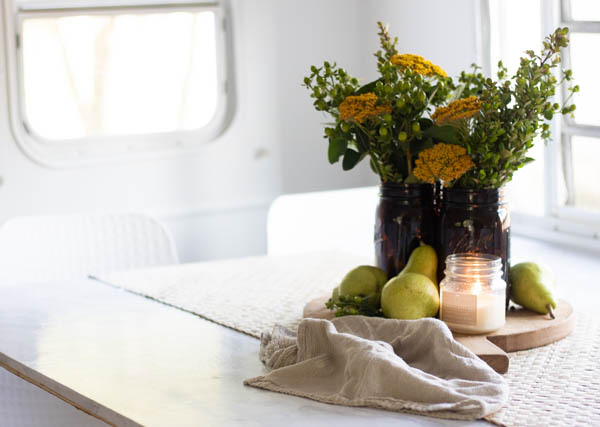 I love a good table setting for Fall and to create something with candles and flowers that say autumn is something that anyone can do. This actually all started when I got some Ball amber jars back in the spring. I knew I would use them, so I did not pack them away with the rest of our stuff, but hung onto them for the purpose of creating something beautiful for Fall. 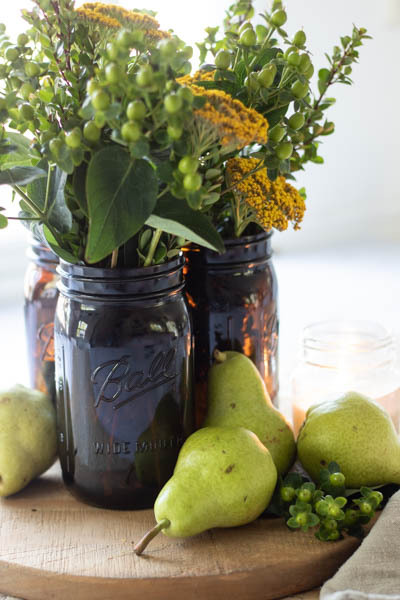 Amber jars seem to be the color of the season and paired with some pretty greenery (that lasts way longer then flowers) and some pears and a bread board, and you got yourself an easy fall centerpiece that’s great for a Thanksgiving table or a camper home. I also love the idea of using greenery for early Fall since it’s an easy way to transition this early on to Fall. I think since the ones I chose has some green berries if felt fall-ish, and adding some pretty yellow for a fun pop of color. Yellow too can be a great Summer or Fall color so I feel the centerpiece I created was a great start to my fall decorating. So I started with a Bread board and then added my three amber Ball jars on top. Then filled up the jars with some water and cut down my greenery branches to the right size. I added them evenly to the jars and then popped in some yellow flowers here and there. 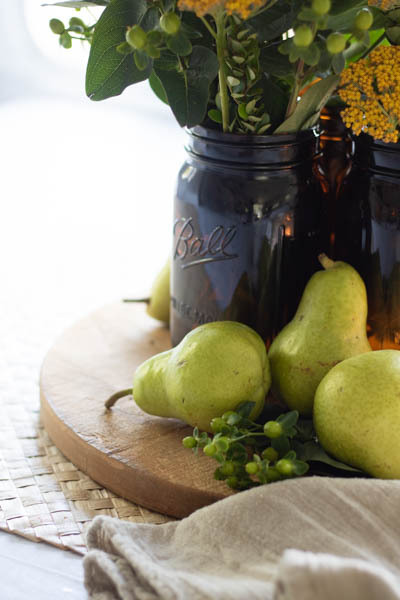 For the pears always use an odd number amount, so I used 5 and then placed them naturally around the jars for a natural feel. I love how it turned out and then lit me candle to give the centerpiece more ambiance and of course that Fall aroma. 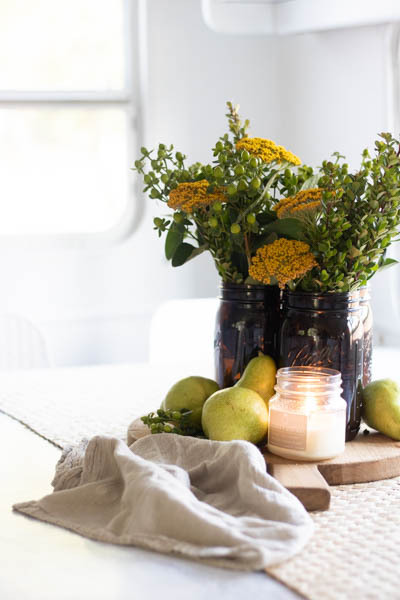 Super simple and you can recreate with your own favorite greenery or flowers, and if you prefer to grab faux greenery that would also work for Fall table decorations. 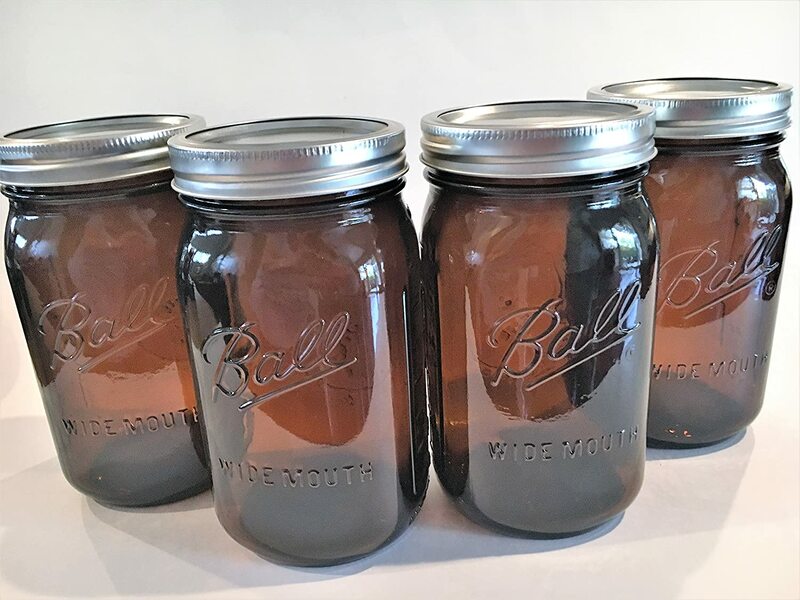 Getting a lot of requests about our Amber jars, you can shop them here! This is beautiful! 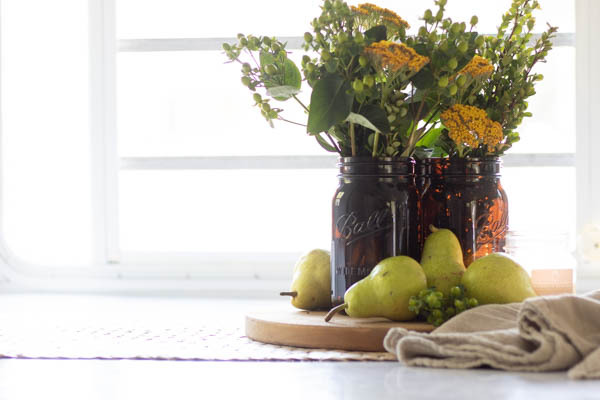 I’m always looking for simple, neutral fall decor inspiration, and this is perfect! And those amber mason jars are awesome. Thank you for sharing! Thank you so much Melanie! I felt they were just right to transition to Fall. Love this centerpiece, Deb! The earthy colors and the glow of the candle is gorgeous!